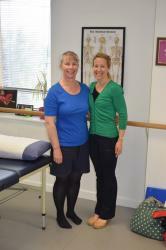 On Friday mornings, Petra Enrico holds a physiotherapy clinic - aimed primarily at Colours of Dance community students and families, but available to anyone beyond that who would like to see a physio. Depending on the problem, 60m or 30m consultations may be booked. For follow up appointments, the usual requirement is a 30 minute appointment. Petra will advise you if you need something different. Rates for appointments will be advised on booking/enquiry.